If you have any designs which would would like me to make please let me know and I'll do my best to add them the the cosybedsandburrows range. Made with soft anti-pill fleece and lined with polycotton fabric. 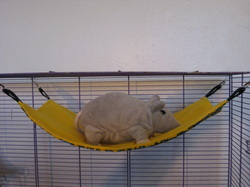 Our hammocks are large enough for a rat pile, or a guinea pig or small rabbit. They hang from the bars of your cage, or add hooks inside your hutch to hang them from. They add levels to your pet cage, safety from long drops and most importantly a snuggly place to sleep.